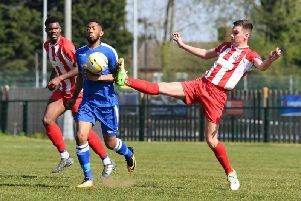 Leighton Town remain outside the relegation zone despite having their game against Royston Town postponed on Saturday. Stuart Murray’s men were given a late call that the Garden Walk pitch was waterlogged, forcing the game to be called off. Leighton’s 1-0 win last Saturday over Fleet Town saw them climb out of the Evo Stik Division One Central drop zone. Aylesbury United replaced them in the bottom two, but suffered defeat as Fleet Town bounced back to win 1-0, leaving Leighton Town with two games in hand over the Ducks. Leighton are next in action on Saturday when they play Egham Town at Bell Close. Earlier this season, Leighton picked up a 2-1 win over Egham, who currently sit eighth in the league standings.